Between INXS and Midnight Oil, you couldn’t blame a major label artist and repertoire representative for trying to mine Australia for the next college rock success story. I was expecting Midnight Oil or Icehouse, but I ended up with something funkier and way more boisterous. I thought about picking up the band’s 1989 album These Here Are Crazy Times, but it lost out to many other releases that year. Boom Crash Opera fell off my radar completely till I spotted the band’s self-titled debut at the Lifelong Thrift Shop. For $1, it seemed worth the risk, plus Alex Sadkin was listed as one of the producers. Sadkin worked with Duran Duran on Seven and the Ragged Tiger. True to form, Sadkin’s studio wizardry coats Boom Crash Opera with an appealing sheen, but he doesn’t water down the band’s hard, funky sound. If I had been introduced to Boom Crash Opera with this album rather than “Onion Skin”, I might have become a casual fan. 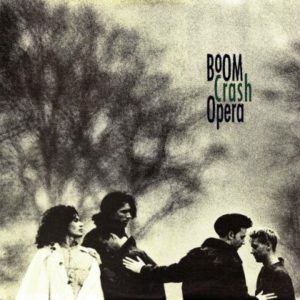 The writing on Boom Crash Opera is solid, and while the album’s production is an artifact of its time, it skews toward the era’s better angels. Boom Crash Opera is still around and pretty much sticks to Australia these days. None of the band’s international releases are in print, nor available on streaming services.